The Pollocks were further motivated by coffee’s widespread popularity in the city: even without a specialty scene, coffee was king in Miami. Cuban-style espresso drinks were most popular. Customer favorites include the Café Cubano, made from a shot of espresso whipped with a lot of sugar, the cortado (steamed milk and espresso), and the cortadito (espresso, sugar, and steamed or evaporated milk). Often made from pre-ground industrially roasted coffee, these drinks are also cheap. In 2010, Joel and Leticia started Panther Coffee, the city’s first small-batch specialty coffee roaster, retailer, and wholesaler. 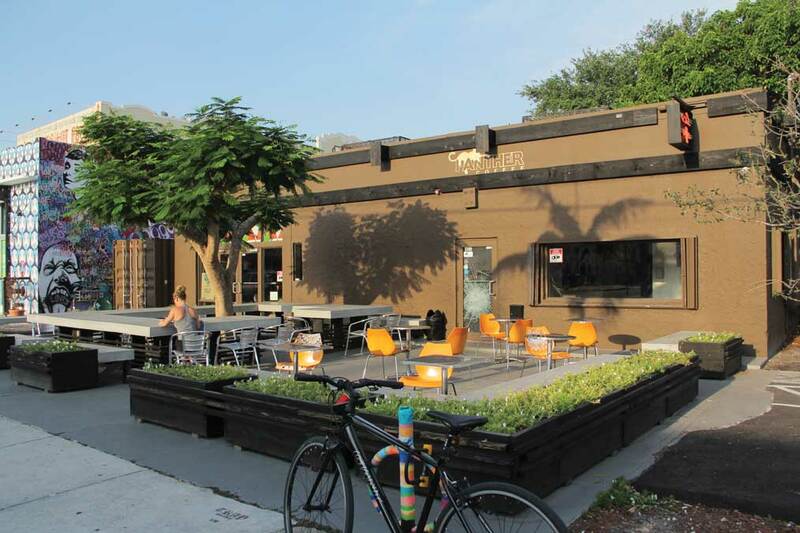 The flagship café opened in the then-transitional and now artsy Wynwood neighborhood, and has become a meeting place for the creative community. 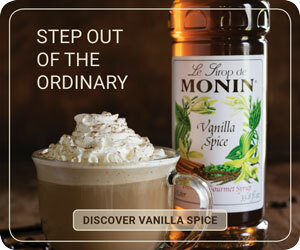 Stepping up the local game meant introducing a higher-quality product that was locally roasted and manually brewed. They tapped the producer relationships they had forged over the years and came up with a selection of single-origins, as well as two signature espresso blends. The East Coast blend is chocolate-forward and full-bodied, while the West Coast blend uses African coffees for more acidity and a sparkling, floral flavor. Panther roasts on a vintage ten-kilo Probat Perfekt from the twenties. 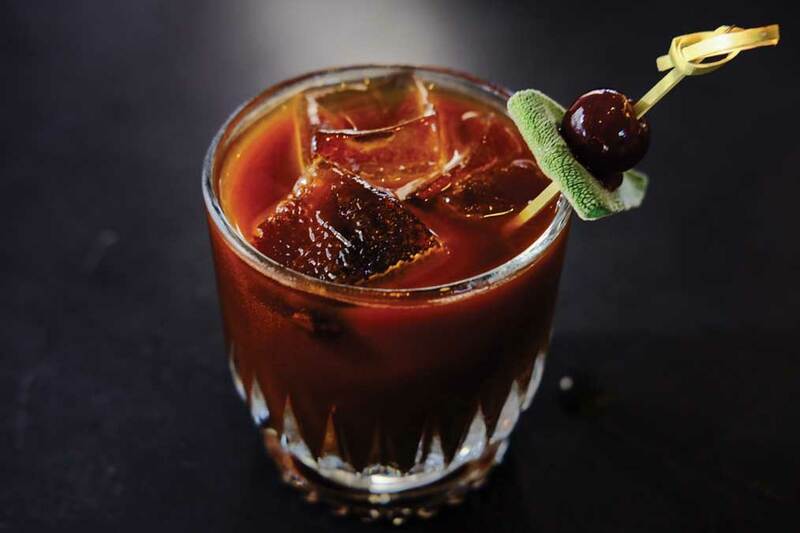 Their menu includes a variety of brew methods, including Chemex, french press, Kalita Wave, and BKON—even their own take on Cuban-style espresso drinks. “We stay true to what we came to the table with, but we added a cortado and a cortadito to the menu. It’s our version of what that would be. We don’t put sugar in the espresso,” Joel says. Educating their customers about what they were doing differently was part of getting off the ground. “That’s true of any market. It’s not necessarily unique to Miami but we definitely had a little bit of education work to do. We do that on a daily basis. We make it about our coffee program, where we’re buying coffee, how we roast it, and how we prepare it. We do a lot of training in house,” Joel says. A three-time Good Food Award winner, Panther has locations in Miami Beach at Sunset Harbour and Coconut Grove. This year, they’ll open a new café and roastery headquarters in Little Haiti, and a café in the MiMo district. 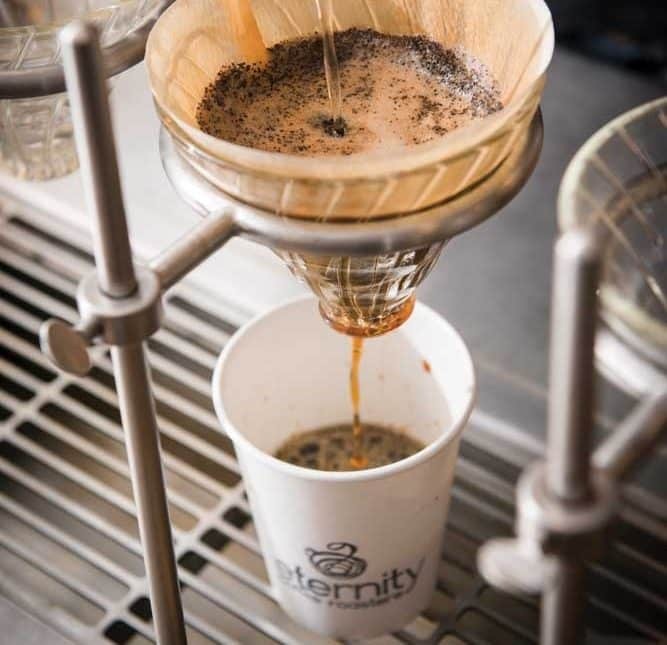 About a month after Panther opened, Eternity Coffee Roasters debuted a downtown café, fueled only by a pour-over bar. Johnson had gained years of experience working with a coffee importer. For Eternity, he teamed up with co-owner Cristina Garces, whose family owns Finca La Eternidad in Antioquia and supplies the company’s Colombian beans. Eternity also sources from other producers across Latin America and Africa. 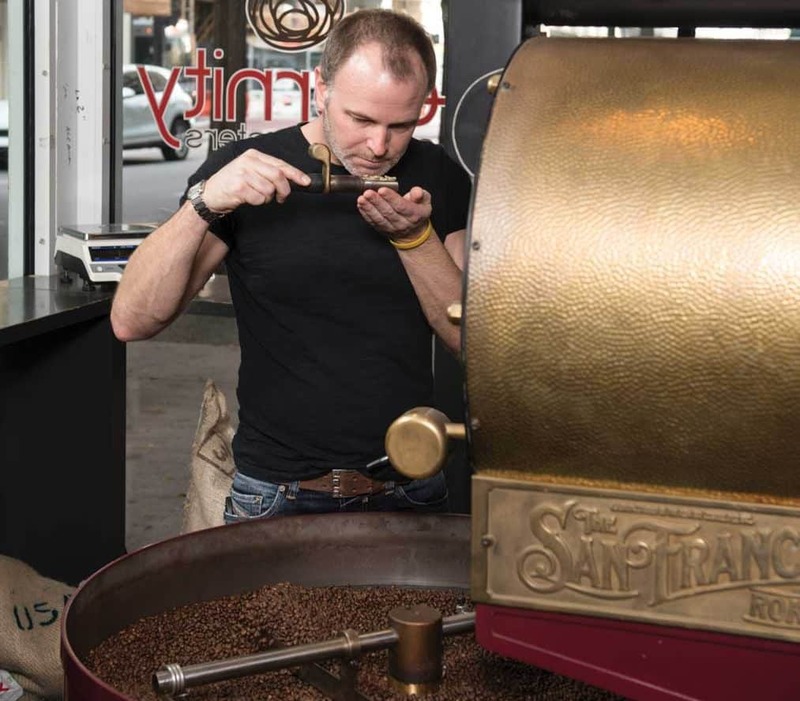 Johnson roasts in-store on a twenty-five-pound San Franciscan for clients that include the local French café MIAM and thirty Whole Foods stores across Florida. In the Eternity café, drinks are made on the custom steel pour-over bar Johnson designed to accommodate up to seven simultaneous Hario V60s. Eternity keeps things fresh by experimenting with new flavors, such as the nitro cold-brew infused with pomegranate. “We also do a Toxic Tonic, which is tonic water and espresso. We’re in a tropical climate so the market is looking for some cold drinks,” Johnson says. 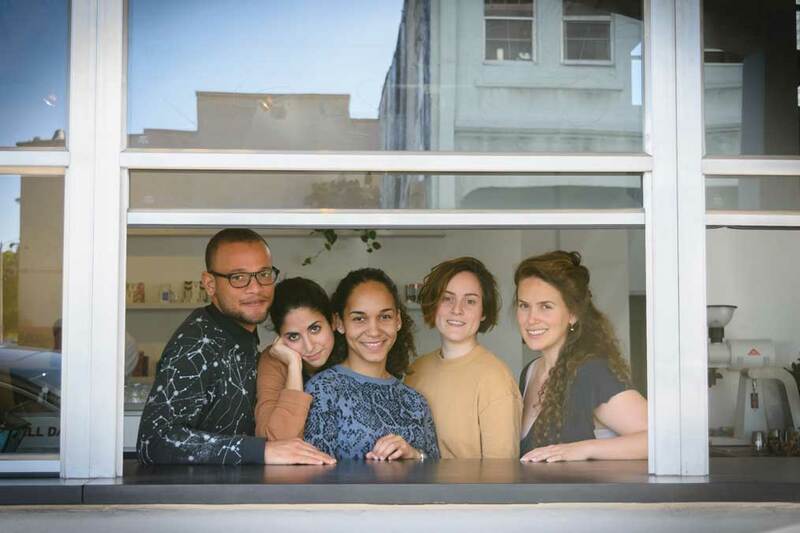 Camila Ramos’s All Day opened in May 2016. Located in the Park West neighborhood, it’s a coffee bar and restaurant with a menu showcasing farm-fresh eggs. All Day’s drink-ordering system helps customers hone in on exactly what they want. Baristas walk customers through a series of questions to determine whether they prefer espresso, manual brew, drip coffee, a milk pairing, or another offering. Additional questions help select the size of the drink and preferred texture—microfoam isn’t a mandate. “We see it as a flowchart. It’s not like we say, here’s every single option you can order. That would be overwhelming. We guide customers,” Ramos says. 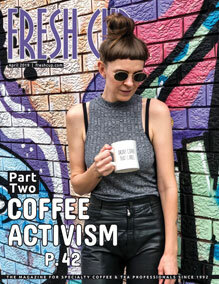 Being in an international city, Ramos finds that customers have varying ideas about how drinks such as a cappuccino or a latte should be prepared based on their own experiences. She wants to get it right. All Day’s Winter Solstice includes a double shot of espresso, black tea, winter spices, and orange. Drinks are prepared on the custom five-group La Marzocco Strada (a two-group EP and three-group EE), which gets plenty of use. “Miami is a city that is very espresso heavy. In most other specialty coffee shops in the US your main concern is how are we going to make this many pour-overs. We’re able to make our pour-overs because we don’t really get orders for them that often,” Ramos says. Seasonal features include cold-brew mixed with rosemary limeade, and the Royal Tea, a cascara-based milk tea. Customers can also order a cupping flight, consisting of three samples from the multi-roaster program, which includes Ruby Coffee Roasters, Toby’s Estate, Kuma Coffee, and local roaster Per’La. In a city without a strong culture of customer service, Per’La seeks to be the exception. 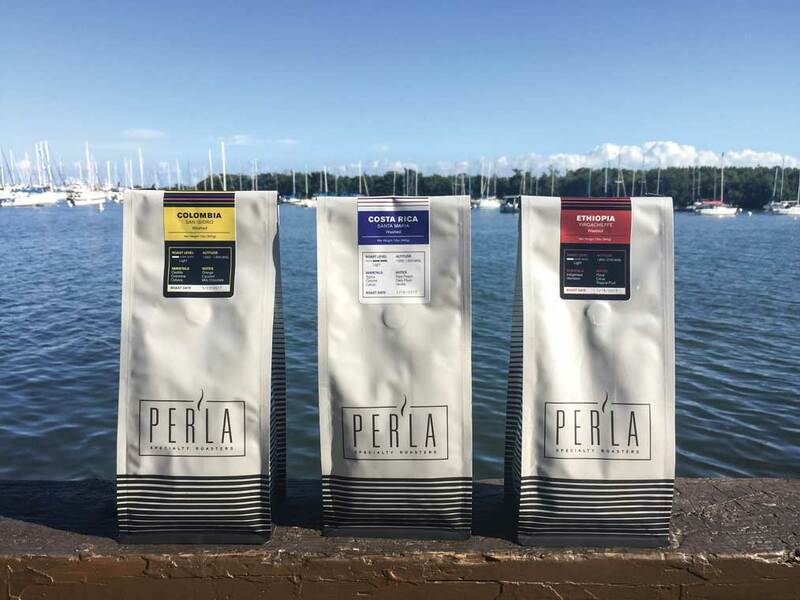 Paul Massard, a certified Q grader, and Chris Nolte are the managing partners of Per’La Specialty Roasters. Massard gained experience as a green coffee buyer and as the director of operations for two coffee farms in Hawaii. Nolte’s background is in business development and branding. 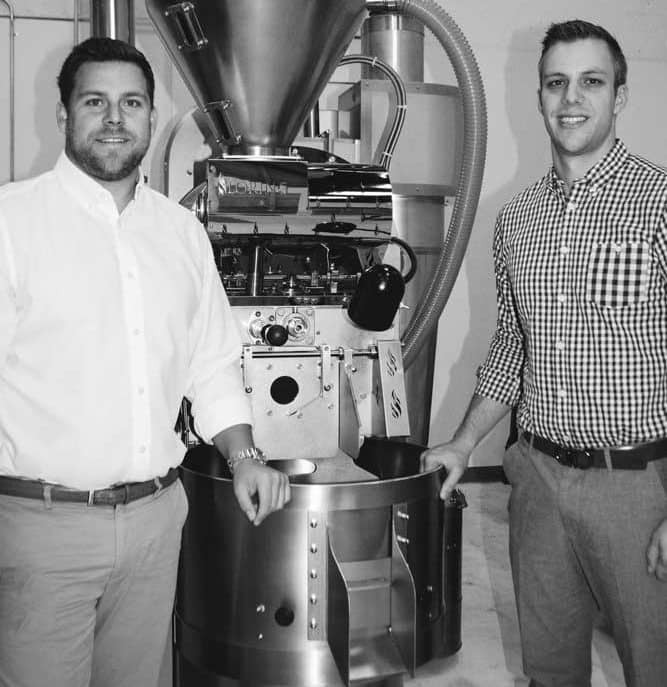 Friends since attending the University of Miami, Massard and Nolte used their diverse skills to form the roastery in 2015. Per’La roasts on a fifteen-kilo Loring Falcon in South Miami’s Bird Road Art District. 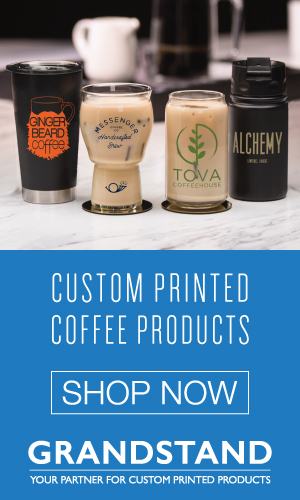 They create custom blends and offer highly ranked single-origin coffees to clients that include boutique hotels, restaurants, and coffee shops that prioritize creative cuisine. “Helping the city grow from a culinary aspect is something that we place the focus on,” Nolte says. Per’La’s owners want to be exemplars for customer service, which they say the city lacks. 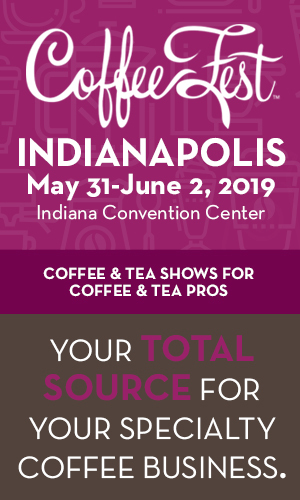 “Our customers are often surprised about how present we are on accounts, but it’s really important to us to have a coffee partnership,” Nolte says. They also offer training to their wholesale clients. They provide barista training sessions for all interested staff, as often as necessary, and encourage clients to come to the roastery to check out the operation and learn about their process. Education is critical for both growing their business and moving the specialty scene forward. “As we continue the education and teach companies what great coffee is, they’re going to go out and share that with their friends. If that spreads like a web we hopefully will have our pool of specialty coffee drinkers growing, which will then elevate the coffee level in general in Miami,” Massard says. Over the past seven years, specialty coffee has taken root in Miami. 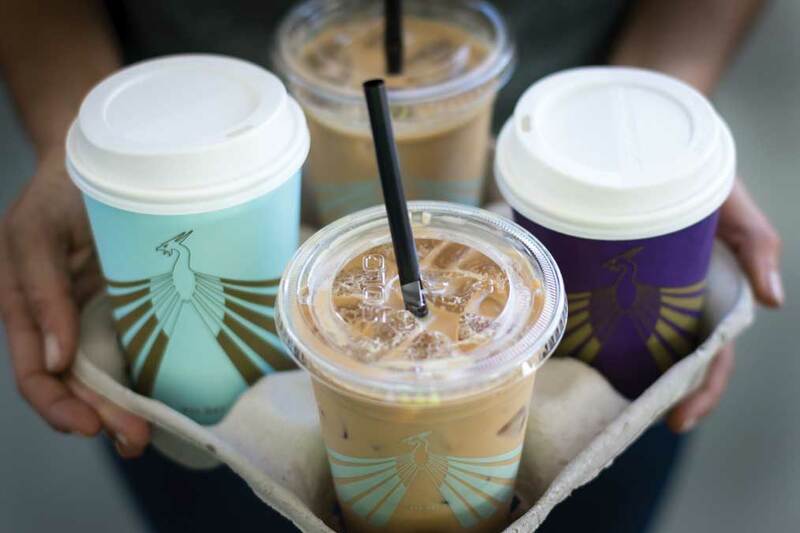 Small specialty roasters continue to open; Alaska Coffee has been in Miami for several years, and Blue Bottle announced plans to open two shops this year. —Willona M. Sloan is a freelance writer based in Washington, D.C.